Every October the Santa Maria Ship Museum becomes the Haunted Pirate Ship. The dock is inhabited by pirates in all sizes and shapes and a cemetery holds the ones who came before. Your pirate tour guide will introduce you to Captain Booney as he steps out of a storybook and tells the tale of his ill-fated crew. 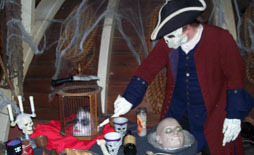 Heads may roll, spiders may talk and ghosts and skeletons will “shiver your timbers” as you take a tour of the haunted vessel. This family friendly adventure guarantees a “little boo” for everyone. The Haunted Ship started out as a fun event for the staff and volunteers to produce. Over the years it has evolved into a profitable fundraiser for the museum, drawing 500-800 people annually. The Haunted Pirate Ship attracts both the young and the young at heart. For many years the Haunted Ship was one of the few places to take young kids for a Halloween outing. The event keeps blood and guts to a minimum and yet promises enough surprises that both teens and adults will enjoy the fun. When: Thursday-Saturday, October 27, 28 and 29 from 7-10 p.m.
For more information and tickets: Visit www.santamaria.org. Adult admission for ages 12 and up is $5; seniors 60 plus is $4.50; and youth 3-11 is $3.50. Photographs can evoke emotional responses that transcend human speech and the written word. Such is the impact of Shifting Perspectives, a poignant photography exhibition that provides insight into the joy and wonder of what it is to be human – and living with Down syndrome. A selection of photographs, taken over a nine-year period, depicts the everyday interactions of people of all ages who are living with Down syndrome. Removed from stereotype, the photographs challenge conventional attitudes and are the catalyst for renewed perceptions of identity and individuality. The images relay a breadth of possibilities for expression and personal achievement. The exhibition has traveled from the U.K. to Turkey, Canada, Colombia and South America. Dublin Arts Council is proud to host the U.S. debut of Shifting Perspectives in partnership with DownSyndrome Achieves, an organization whose goal--through research, advocacy and support--is to provide the information, encouragment and life skills that enable individuals and families living with Down Syndrome to live healthy and meaningful lives. U.K. photographer and Shifting Perspectives curator Richard Bailey joins local photographers Marcella Hackbardt and Abdi Roble in a discussion of the exhibition and the societal issues it addresses, moderated by Ann Bremner of OSU’s Wexner Center for the Arts, on Sept. 27 at 5:30 p.m. at Dublin Arts Council. A series of workshops will provide interdisciplinary experiences in response to the larger exhibition, and a local photography exhibition will be developed featuring artwork created during the workshops. Where: Dublin Arts Council, 7125 Riverside Dr., Dublin, Ohio 43016. For more information: E-mail langston@dublinarts.org; call 614-889-7444; or visit www.dublinarts.org. Columbus' premier Halloween extravaganza puts DESIGN center stage. The HighBall Halloween Masquerade is a cross between Carnivale and Mardi Gras with a pinch of Halloween and a healthy splash of Short North spirit. In four short years, HighBall has become one of the most talked about Halloween events in the Midwest. The key to its success has been the event's focus on "the art of design and masquerade." The signature of HighBall is a dramatic runway/stage built under the iconic Short North arches. Competitions spotlight the creative talents of professionals and amateurs alike. Finalists (vying for thousands of dollars in cash and prizes) strut their stuff on stage before 20,000 cheering revelers. HighBall celebrates the “fabulous side” of Halloween. It nurtures and promotes the self-expression of fashion designers, costume designers, makeup artists, performers, visual artists, and all of central Ohio's creative spirits. HighBall turns the spotlight on Columbus’ creative class…and, in turn, celebrates the vibrancy, diversity and inclusiveness of the Short North Arts District. The event serves as a fundraiser to support the many initiatives that keep the District thriving throughout the year. When: Friday, October 28 from 5:00 p.m. to 1:00 a.m.
For more information and tickets: Visit www.HighBallHalloween.com. Tickets are $5 at the gate. If you'd like to go all out and attend a VIP guest, tickets are $65 in advance. Art quilt detail courtesy of Galleria Evangelia. Shopping for glass art at the Columbus Arts Festival. Photo by Greg Bartram. Vote for the Columbus Arts Festival!